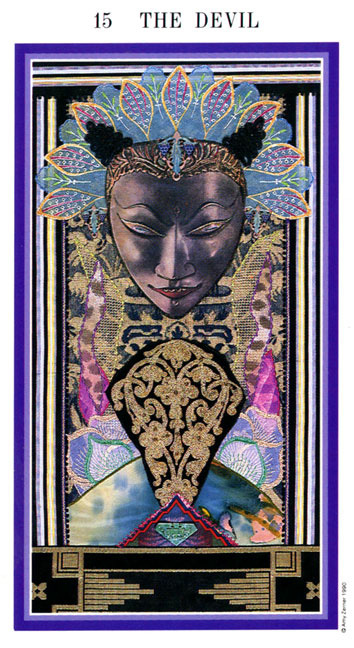 The pictures of the Enchanted Tarot are of a unique collage nature, done in multiple mediums, including oils, fabric, and lace. The suits are color coded: Wands are red, Hearts are purple, Swords are blue and Pentacles are green. In general, the color scheme used throughout this deck represents the healing qualities for each element and card. The Devil is a demonic oriental mask with dark horns, wavy eyebrows, and slitted eyes: looking down longingly at the material world whose carnal pleasures it yearns to experience.